My kids are 22, 17, and 15 and I have 3-4 short years left of homeschooling. As my children transition from school kids to young adults, getting jobs, leaving home, spending more time with friends… able to do their school without me for the most part, I find myself with more time on my hands. This is exciting… and a tad terrifying and yes, a bit sad. For almost 20 years I have only been a homeschool mom. That was my title, my purpose. I defined myself by my responsibilities as a homeschool mom. I mean geez, most of my blogging was school and family focused and frankly, I am running out of material to write about! Now as this era comes to a close I look forward to being able to find myself again, to find who I am now in life, to rediscover who “Becky” is, to see where the “third act” of my life takes me. I try to look at it with an eagerness but I also feel a touch of anxiety and depression. Thoughts of, “How will spend my time?” “Will I be lonely?” “Who am I when you take my children from the equation?” flood my mind. I needed something to do that gives me purpose, that feeds my soul. Something to redefine myself. I needed to find something to pour myself into with a passion. I think I may have stumbled upon it. My kids started doing the rock hunts also known as “kindness rocks.” One evening, we all sat down as a family and painted some rocks to hide. It was fun! We just did some simple paintings nothing spectacular. A few weeks later I decided to try my hand at painting some rocks with a bit more effort. 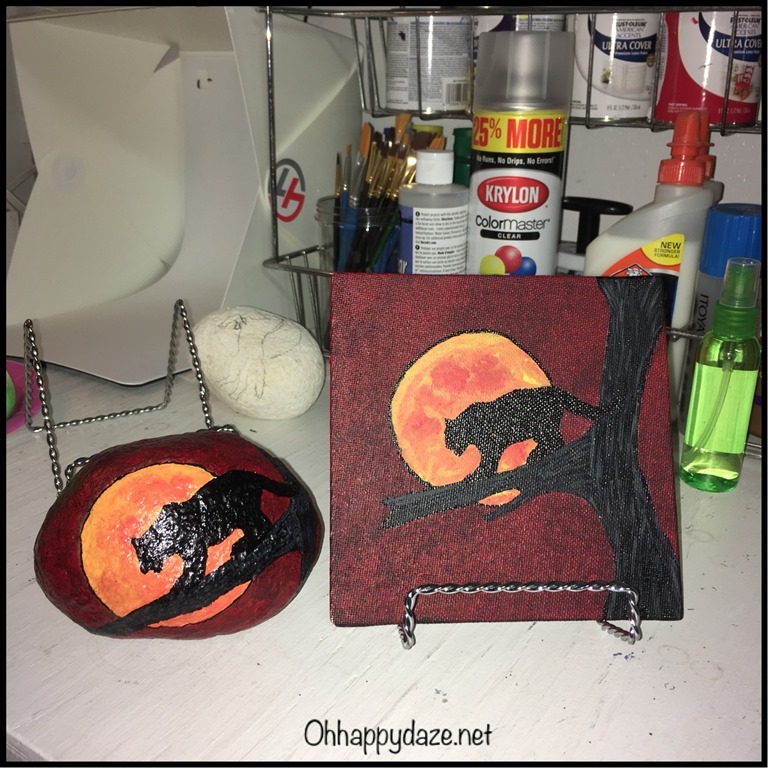 I purchased a large bag of large rocks, some paint, and paint pens and got to work. I started out with simple kid-friendly paintings and advanced to more artsy looking sunsets, moons, and silhouettes. After working with the rocks for a few weeks I decided to attempt to paint on canvas. At first, it was very awkward to change types of painting surfaces. I was used to the way the rock reacted to the paints. 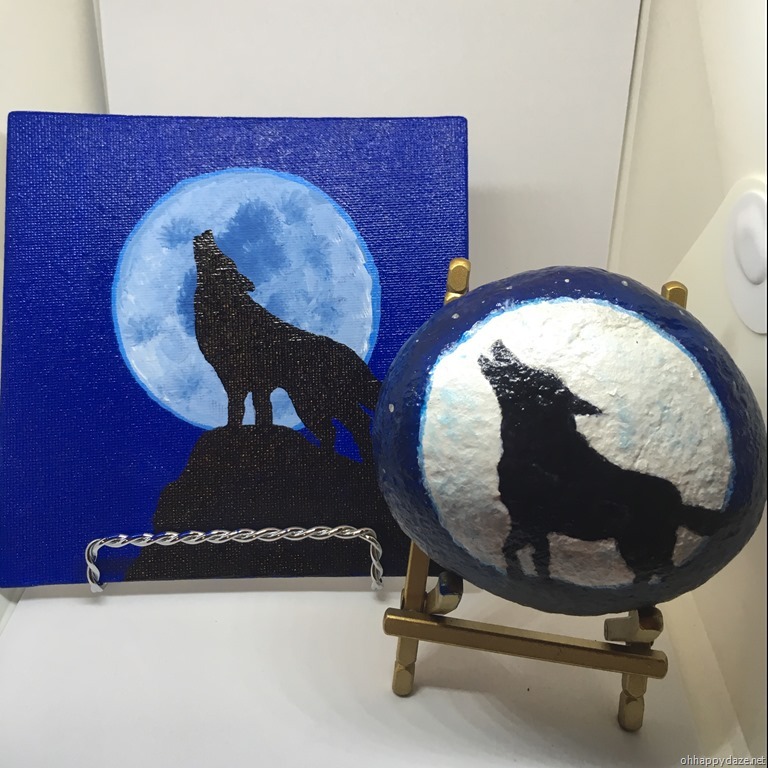 It didn’t take long to adjust and painting a canvas is much easier to paint than a rock but I tend to like to make a matching rock/canvas set of each of my designs. So as I am less needed to be the kids’ teacher, and as I explore my artistic side, my posts will also transition from homeschooling to art. I hope that following my posts about my transition may help other moms out there who are struggling with their transition period as well. Empty nest is no joke, it is hard and depressing. And as a homeschooler, you can lose yourself in the idea of home educating your kids, you can forget who YOU are or who you want to be. I feel like empty nest is harder on homeschool moms because we are used to having the kids around day in and day out. Then one day we look up and aren’t used to the quietness of a child free home. It is eerie and unsettling. We wonder where does this leave us? We forget who we used to be. We wonder if who we used to be is who we are now. It can hit hard! So I hope my posts will help you moms out there who are feeling the loneliness creeping in and realize that this phase can be an exciting new time of self-discovery and heart lead passions. So relax and embrace the new you! The links below are affiliate links! That means if you find something you love, and I am sure you will, by making your purchase using these links I get a small commision which is super helpful to support my family!! Sooo… thanks in advance for your purchases!!! Posted on November 21, 2017, in Art and tagged Empty Nest, Painting. Bookmark the permalink. Leave a comment.